This is one of the first books of it’s kind. 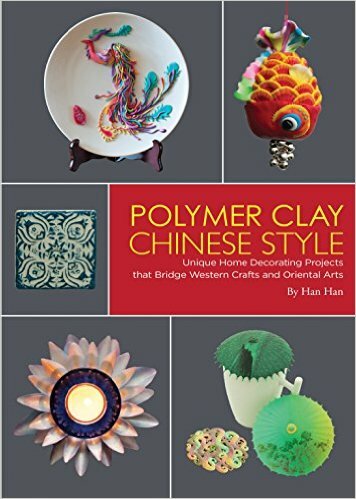 A book written with projects that fill a particular cultural genre or style … and I happen to LOVE that about Polymer Clay Chinese Style. However, there are likely that many who also find the book unfulfilling and tedious with projects that don’t appeal to them. Polymer clay can be transformed into a variety of objects, such as birds, animals, plants, and food. Have you ever tried to merge this western craft with Asian culture to explore another type of artistic aesthetics? The instructions along with illustrations of the lessons are easy to follow. Through this learning process involving art, you can even come to understand more about yourself—what you like, your strengths, and what you can achieve. This is a way to learn how to work and listen to yourself, and how to deal with your emotions. It’s also an opportunity to stimulate your potential artistic power. This book contains 20 individual projects and many different techniques. While this book doesn’t add any novel new techniques to polymer clay, it does have some great tips, tricks, and caning shortcuts. I will definitely be making several of the projects in this book and using them for my own home decor. OVERALL: I give this book a 5 star rating. The machine that kneads clay for you. Does it really work how much does it cost and is it worth it. It’s a very handy tool for old clay. If you don’t have old clay though, I’m not sure you will find it worthwhile. If you have arthritis or other hand issues, it may really help you!